Securing national borders and stopping international criminals before they can enter the United States requires support, assistance, and action from the land, air, and sea. U.S. Customs and Border Protection Aviation Interdiction Agents earn great salaries flying missions to do their part to help keep U.S. borders safe and secure. What Do CBP Aviation Interdiction Agents Do? The U.S. Customs and Border Protection's Office of Air and Marine claims to be home to the largest non-military air force in the world, with more than 250 aircraft in the fleet. 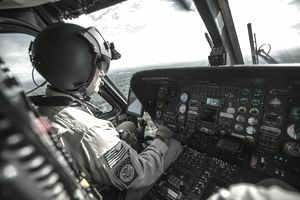 U.S. Customs and Border Protection Interdiction Agents are certified pilots who fly airplane and helicopter missions in support of the CBP's mission to keep dangerous people, drugs, weapons, and other hazardous materials from making their way into the United States. In law enforcement terms, the purpose of interdiction efforts is to stop criminal activity before it reaches its destination. As fully certified federal law enforcement officers and pilots, aviation interdiction agents patrol the skies around U.S. borders to keep people and vehicles - whether planes, cars, trucks, or boats - from entering the country illegally. Through their efforts, aviation interdiction agents not only keep undocumented and potentially dangerous aliens out the country but illegal drugs as well. They play an important role in drug interdiction and terror prevention, in addition to their role as customs enforcement agents and border patrol support. CBP Aviation Interdiction Agents are required to travel at least 25 percent of the time on the job, and possibly more. CBP Aviation also provides support for border protection for U.S. interests overseas, so you may be temporarily assigned to foreign duty, as well. As a Customs and Border Protection Aviation Interdiction Agent, your base pay would start between $58,562.00 and $76,131.00 per year, depending on what level of the federal pay scale you are hired at. If you're hired at the GS-11 grade, your starting pay will be about $58,000, with the chance to promote to $83,000 at the GS-13 grade level. The base pay does not include the federal Law Enforcement Availability Pay, which significantly increases your earning potential. It also does not include federal locality pay, which may vary depending on where your duty assignment is. In order to become a CBP Aviation interdiction agent, you must first and foremost be a certified pilot of fixed-wing or rotary aircraft (airplanes or helicopters). Because of the diversity of aircraft the CBP uses, you may need to be a dual-rated pilot, so pay attention to the job announcement you apply for. As part of your pilot's credentials, you will need to have logged at least 1500 flight hours, with at least 100 of those hours having been logged within the past 12 months. You must also have a current FAA Class I or Class II medical certificate. To be eligible for hire as a CBP Aviation Interdiction Agent, you have to be under the age of 37 at the time of hire (with certain exceptions for military veterans), be a United States citizen, hold a valid driver license, and you must have lived in the United States for at least the past 3 years. You'll also need to be able to pass a stringent background investigation, which will include a polygraph exam, as well as meet medical and physical fitness standards. If you are a pilot and you're interested in using your unique in-demand skills and abilities to support the mission of keeping U.S. borders safe and secure, working as a U.S. Customs and Border Protection Aviation Interdiction Agent may very well be the perfect criminology career for you.